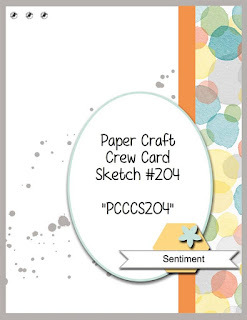 Welcome to Wednesday's card sketch challenge this week at the Paper Craft Crew. This is a really versatile sketch and we hope you will join us. Here's my card using some Stampin Up card and patterned papers combined with an image from Kraftin' Kimmie stamps. I haven't used this one before, but I made it as a Birthday card for my brother in law. He and my sister went to a Burlesque show recently and this lady reminded me of that. The cardstock is Basic Black, Real Red, Whisper White and Pool Party. Paper is from the Back to Black pack from last catalogue. The image was coloured with my Copic markers and I used my Wink of Stella over parts of the image. Can you see the sheen on her eyeshadow and feathers? Greeting is from the Teeny Tiny Sentiments stamp set. 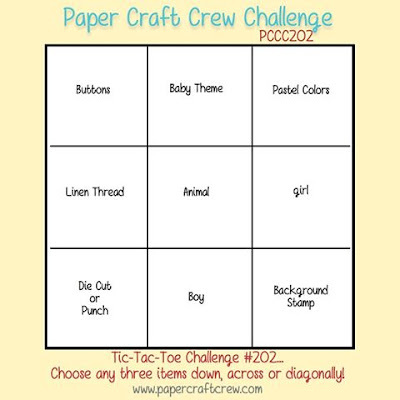 We hope you will join us for this sketch challenge at the Paper Craft Crew. Can't wait to see your creations. Have a great day. Welcome to another challenge at Stamp Ink Paper. We have a sketch for you this time which we hope you will join in with. The cardstock used is Rich Razzleberry, Smoky Slate and Blushing Bride and the patterned paper comes from the Blooms & Bliss pack. My tag has been made with Detailed Floral thinlits and the Scallop Tag topper punch. Stamps used are Rose Wonder for the greeting and Number of Years for the leaves. Inks were Rich Razzleberry and Smoky Slate. Please visit the Stamp Ink Paper challenge and see what our other designers have created this week. We look forward to you joining in. This was a card made for my catalogue launch a few weeks ago to show some of the new In Colours which I combined with Affectionately Yours designer papers. The stamps are Thoughtful Banners and Flower Patch with matching framelits and Banner punch. The cardstock is Flirty Flamingo, Emerald Envy and Whisper White. The White background was embossed with the Lovely Lace embossing folder. This was simple but effective card and used the new colour inks Flirty Flamingo and Emerald Envy as well. Flower was stamped 3 times with the top 2 layers fussy cut and finished with a Metal rimmed pearl. Welcome to another sketch challenge at the Paper Craft Crew. Here is this weeks sketch. I'm making another Christmas card using This Christmas dsp for the challenge. I've combined the papers with Cardstock of Garden Green, Cherry Cobbler, Basic Black and Very Vanilla. Framelits are Lots of labels and Stamp set is Oh What Fun. Here's a closeup of the tag made by layering Lots of Labels framelits and adding some of the Copper thread between them. So glad you stopped by and we really hope you will join in with this weeks challenge. Make sure you check out our other amazing team members cards for your inspiration at the Paper Craft Crew this week. Welcome to our challenge this week at Stamp Ink Paper. It was my turn to choose and I chose the Black and White colour theme. I love Black and White, a classic combination that's always elegant. We hope you will join us for this weeks challenge and look forward to seeing what you make. I've used the Butterfly Basics stamp set for my flower which was stamped with Versamark and heat embossed with Black embossing powder. I then painted the background with a black ink wash and my Aquabrush. My cardstock is Basic Black, an Shimmer White and I've used some retired paper from the Back to Black pack. I used a permanent black marker to colour my basic rhinestones black as well. 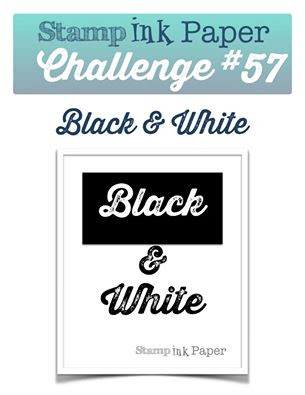 We hope you can join us this week for our Black and White themed at Stamp Ink Paper. I've made a couple of Easel Cards for upcoming b'days for my daughters 15 y/olds friends, however she doesn't have a need for these as yet as I made quite a personalised verion for her friend Holly which I showed a couple of weeks ago. These are the same style of Easel card using stamps Gorgeous Grunge and the background of You've Got This with Star and Large number framelits. I was told no flowers, butterflies or hearts on these cards. I really do enjoy making Easel cards and these were fun. For sale, if anyone is looking for cards for 15 year olds. I've chosen to work with the top horizontal line for my card - Buttons, Baby Theme, Pastels. This card incorporates 2 stamp sets, Celebrate Baby (retired) and Honey Comb Happiness(SAB). Cardstock I chose was Mint Macaron, Blushing Bride & Whipser White. I added some Mint Macaroon print paper from the 12 x 12 In Colour stack an used Blushing Bride buttons from my stash and a Honeycomb embellishment for the balloon. Here's a closer look. While I was making this Baby card with pink I decided I would make another with some blue. Here it is. Same materials and design only the pink card has been switched out for some blue, in this case retired colour Baja Breeze from my stash and I used the reverse side of the Mint Macaron paper. I then took a pic of both cards side by side. 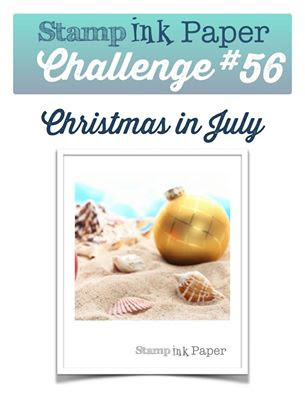 Welcome to this weeks themed challenge, Christmas in July. Its very timely as I love to start making my Christmas cards early and I encourage my girls also by running a Christmas in July card class which I'm currently preparing. We would love for you to join us at Stamp Ink Paper with your Christmas creations. Here's my Christmas in July card collection for the challenge. You only have to make one project. I was on a roll. The materials I used were cardstock of Cherry Cobbler, Very Vanilla and Gold Foil. Inks were Garden Green and Cherry Cobbler. The patterned paper was from the new specialty paper called This Christmas. Stamps were Falling Flowers and Oh What Fun. Framelits were May Flowers, Christmas Greeting thinlits and Wonderful Wreath. Here's a picture of each of my cards. I've used additional Gold Ribbon on this card above and a Gold Glimmer brad from my stash. Here's one of the cards my ladies made at my Blooms & Bliss class. Class consisted of Blooms & Bliss stamp set and the matching Blooms & Bliss Designer papers. Cardstock for this one was Sweet Sugarplum, Rich Razzleberry and Blushing Bride. I've used Blossom punch and Butterfly thinlits and some Dazzling Diamond glimmer card as a bottom layer to my butterfly. I've also used the Banner punch for the greeting. So glad you could stop by to see my card. Have a great day. This was a Sympathy card I created using the new Rose Garden thinlits dies and Rose Wonder stamps for the sentiment. The cardsock I've used is Basic Black, Rich Razzleberry and Very Vanilla. The rose image has been cut from Rich Razzleberry card and adhered to a background of Timeless elegance designer paper. Simplicity was the key to this card. Its quite elegant but understated considering the purpose of it. Thanks so much for stopping by today. Have a good day. Welcome to our sketch challenge this week at Stamp Ink Paper which comes to us from Sandy. Cardstock of Rich Razzleberry and Pink Pirouette was combined with Blooms & Bliss designer papers and May Flower Framelits. This is a totally stamp free card. I purposely left off a greeting so that this card could be used for any purpose. Here is a closeup of the flower die cut. 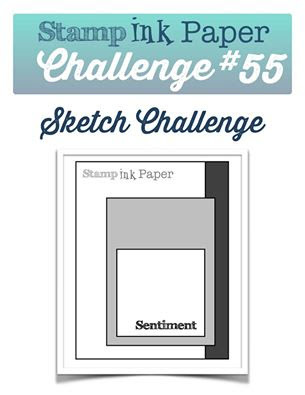 We would love for you to join us at Stamp Ink Paper for our sketch challenge. My eldest daughter attended a Wedding of her Youth Group leader last month and this is the card I made for her. Very pretty in pink. I used some printed vellum, stamp sets Happy Notes and Papillon Popourri, cardstock of Rose Red, Whisper White, Pink Pirouette and some dyed Pink Ribbon roses. Glad I'm finally caught up with some posts so I could share this one. Have a good day.